Watching a forest fire from your own window is one of the saddest views you could ever have. 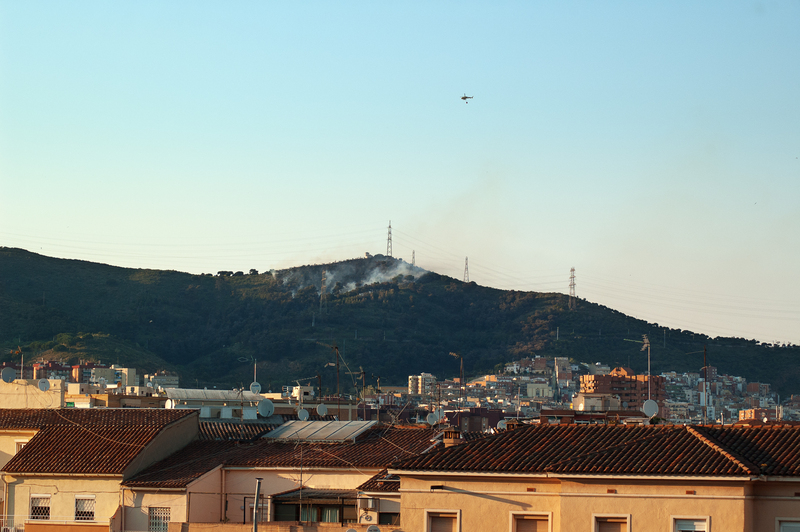 This afternoon a small fire swallowed part of the woods on this hill at Collserola mountain. Now that I write this, at night, everything seems to be under control, but mother nature is not always that lucky. It is true that many forest fires start by a mere accident, like lightnings on a storm but the great majority are due to cigarette butts, bottles that act as a magnifying glass and outdoor barbecue grills which are forbidden. But the worst cause is forest arson which is probably what happened here. This is not the first time there's a fire around Barcelona, in fact one year several hills were completely devastated by the flames. The wind makes things worse and the fact the city is near is dangerous at least for those living at the slope of the mountain. Not a pretty sight, a good reportatge, though. just got back from barcelona, i am in love with ittt! Maybe they were seeking excitement, but they wrecked havoc. We lived through the 1991 Firestorm (started by accident) that burned 3000+ houses and killed 25 people. Large fires create their own weather. Hope you never see such a thing.